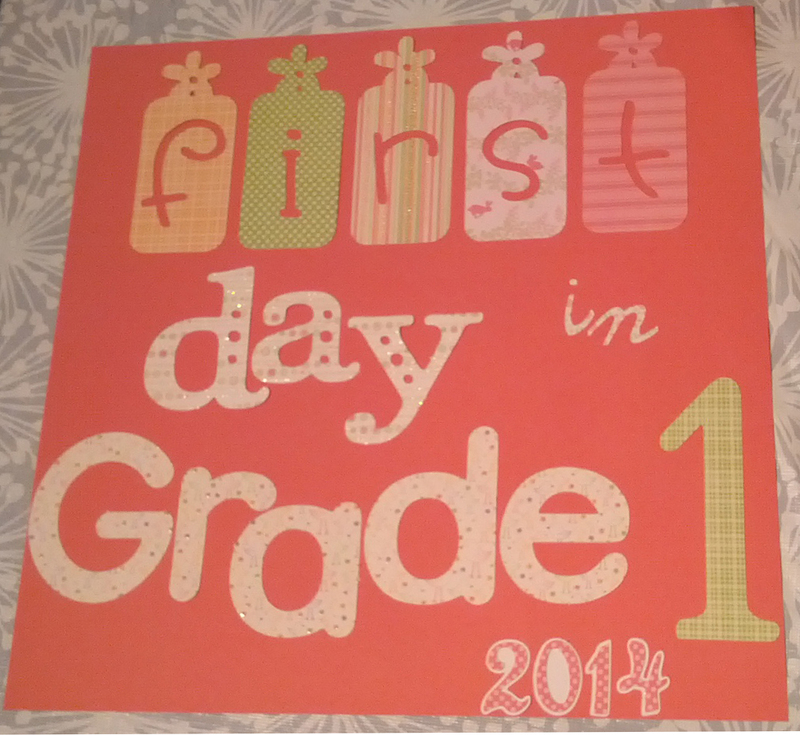 It is the first day of Grade 1 for the Little Bird. 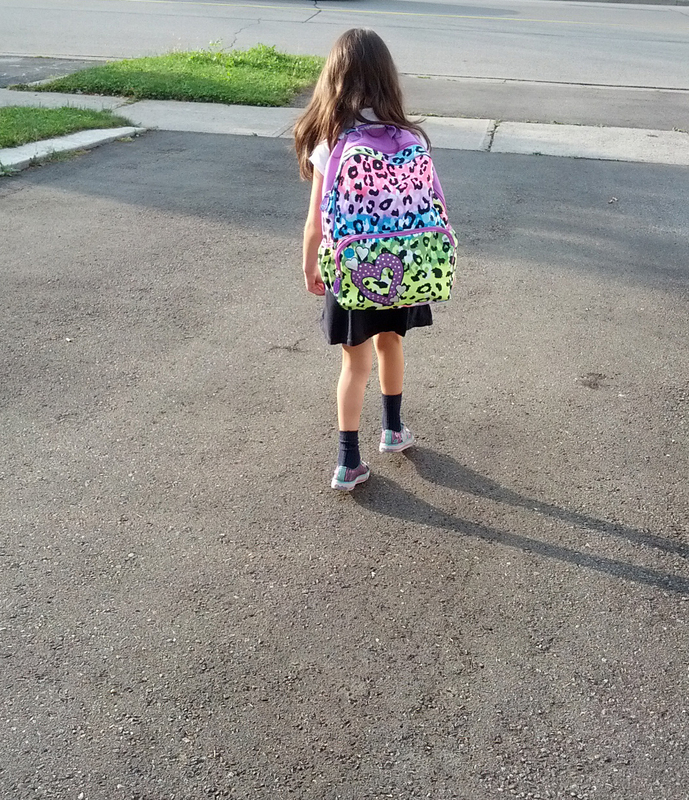 We had a new backpack, two new pencil cases, for all her school supplies; one Monster High and one Ever After, a new lunch bag and a pretty pink headband. I made a sign for her to hold, like I’ve done since JK, and after dropping her sister off for her first day in her new class at daycare, we finished getting ready and took some pictures. She woke up saying her tummy hurt and I told her that she probably felt excited and nervous about the first day of school. She asked me if I used to be excited and nervous for the first day of school when I was little, and I told her that I still get excited and nervous about things. She seemed to calm down after that. She’s a trooper too, and posed for as many pictures as I asked her to and even did our pre-school interview on the camcorder. We walked around the front of the school, saying hi to a couple of her friends from last year, as we made our way to the BIG schoolyard in the back. That was when she got really quiet and stuck to my side like glue. Eventually we saw a few of her friends, kids who have been in the same class since JK. And we all waited for the teachers to come out with the class lists. As soon as they did, we made our way to scan the lists for names. When I found hers, I scanned the rest of the list and only saw one name that I recognized. When I scanned the other grade 1 class, I realized that all her other friends were in the other class. The other name I recognized belonged to a little boy, who she was friends with – as much as boy and a girl can friends in kindergarten. He unfortunately, didn’t like the news of the class lists either, because once he found out that his buddies were in the other class, he started to cry. I explained to the Little Bird that she can see her friends at recess and she seemed okay with that. For about three minutes. I felt horrible that they split the kids up like that. I even spoke with the little boy and his parents about it. We both wished they would have added at least one other kid from their group. You see, the Little Bird was always in the smaller JK and SK class. There were six of them from JK that went together into SK. Now they put four in one room together for Grade 1 and left these two in the other class. Needless to say, the Little Bird and the little boy didn’t like it. Frankly, I don’t either, but there isn’t anything I can do about it. I tried to tell her she was going to make new friends and have a great year, but she wasn’t listening. For the first time since she started school, she was scared and crying and didn’t want to go. I didn’t know what to do. Miraculously, I didn’t cry. Instead I took her out of the line, where she was surrounded by boys she didn’t know, and brought her to a bunch of girls standing near the front and introduced her. One of them even said she knew the Little Bird and said she could stay with them! I felt better after that. The Little Bird didn’t seem to care, but I could tell she preferred to stand with the girls, instead of the boys. I get that they need to learn to adapt to change and make new friends, I just think that it took her as a surprise that neither of her friends were in her class. She will adapt and she will make new friends. I even hope this helps with her shyness. I know she’s going to be great and I wish her nothing but success for this school year. I hope in a week or so, we won’t even remember how she felt today, because she’ll be too busy playing with her new friends. I’m wondering why the school waits until the first day to post the class lists? I recall growing up the class lists going up a few days before school started, and my twins’ school posts the list a week beforehand as well. It’s nice be able to prep the kiddos on who is/isn’t in the class with them, and a way to avoid first day meltdowns, so I’m wondering if you could suggest this to the school for next year? If they’re worried about parents seeing the list early and asking for switches, they could just enforce a “no way your kid is switching” policy, but I’m aghast they wait to tell the littles on their first day. Hope your little one had a great first day! I think this was the first year that they didn’t tell everyone on the last day of school. I think in our case, they had to see what happened with registrations, as its a pretty small school. You make a good point though, which I will be bringing up, that 6 & 7 year olds don’t get why they are not with their friends. Even knowing last week would have helped me prepare her. All that said, she bounced out of class and started listing all the names of the new friends she made. “It’s going to be a good year, mommy!” She said.